Anti-neutrophil cytoplasmic antibodies (ANCA) have become important diagnostic markers of small vessel vasculitides characterized by focal necrotizing lesions of vessel walls and accumulation of lymphocytes and macrophages around the affected vessels. IgG class ANCA directed to proteinase 3 (PR3) of neutrophils and monocytes seem to be directly involved in the pathophysiology of vascular damage by causing excessive neutrophil activation and vessel wall destruction. PR3 and elastase are important players in the mechanisms of vascular necrosis. Methods of detecting ANCA have now been defined but are not uniformly used, even though clinical decisions heavily depend on correct ANCA results. Autoantibodies to human neutrophilic granulocytes (ANCA), described in the early 1960s, were initially demonstrated in patients with rheumatoid arthritis, autoimmune neutropenia, and ulcerative colitis (reviewed in ). The initial observations were by indirect immunofluorescence, in which the antibodies stained mainly the nuclear or perinuclear part of human neutrophils and monocytes, and the antibodies were therefore named `granulocyte-specific antinuclear antibodies'. In the early 1980s, indirect immunofluorescence studies revealed autoantibodies to neutrophil cytoplasmic granules, visible as a distinct, speckled pattern of staining in the cytoplasm (Fig. 1). These antibodies were found in sera from patients with Wegener's granulomatosis, especially those who had active systemic vasculitis . These particular autoantibodies were named `classic anti-neutrophil cytoplasm antibodies' (C-ANCA) . They were subsequently found to target conformational epitopes on a novel elastinolytic serine protease in azurophil granules, proteinase 3 (PR3), which was encoded by a gene on chromosome 19 . PR3 can catabolize a number of human proteins, such as proteoglycans, elastin, and all four subclasses of IgG including the PR3-ANCA/PR3 complex. The latter activity suggests that PR3-ANCA is an inefficient inhibitor of the PR3 enzyme activity . The circulating neutrophils of certain healthy individuals may constitutively express PR3 on their cell surface, and it has been hypothesized that this genetic trait may predispose to small-vessel vasculitis if self-tolerance to PR3 is overcome . 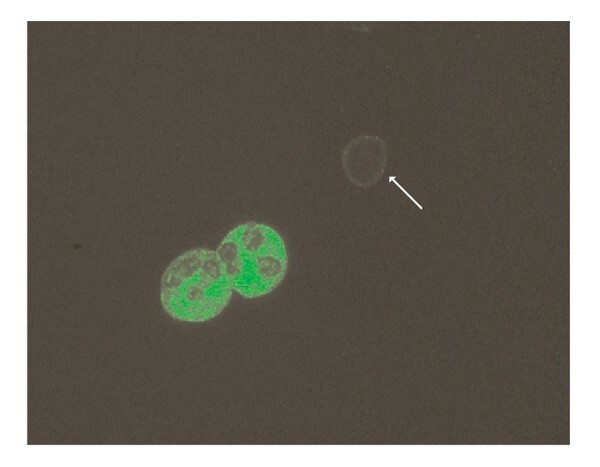 PR3-ANCA of the IgG class giving rise to a typical granular cytoplasmic staining of neutrophils by indirect immunofluorescence. Arrow shows negative staining of lymphocyte. In most laboratories, screening for ANCA is done by use of an internationally agreed indirect immunofluorescence technique using human buffy-coat cells as substrate . Sera positive for C-ANCA are further tested by direct enzyme immunoassay (EIA) to reveal their specificity for either purified PR3 or myeloperoxidase (MPO) as target antigen, both of which can give rise to a C-ANCA staining pattern . The great majority of MPO-ANCA-positive sera, however, bind to neutrophils in a perinuclear ANCA (P-ANCA) fashion, caused by artifactual redistribution of MPO when the cell is permeabilized with ethanol. Whereas the standard indirect immunofluorescence technique for detection of ANCA gave comparable results in many different laboratories from the beginning, it was necessary to set up a European multicenter study to standardize direct EIA techniques for quantifying PR3-ANCA and MPO-ANCA . This multicenter study showed that both EIA techniques could be standardized, and also that PR3 purified by several different methods was suitable for quantifying PR3-ANCA. To optimize the clinical usefulness of the assays, cut-off levels of PR3-ANCA and MPO-ANCA were selected that gave a high diagnostic specificity towards inflammatory disease control patients, distinguishing vasculitis patients from patients that may be mistakenly diagnosed as having vasculitis but have no or low levels of ANCA . Optimum diagnostic specificity required the use of indirect immunofluorescence and EIA in combination . Thus, the simultaneous presence of C-ANCA and PR3-ANCA clearly indicated systemic small-vessel vasculitis, and so did the simultaneous presence of P-ANCA and MPO-ANCA. Recently, data have been reported indicating that a higher sensitivity may be attained without losing diagnostic specificity if the PR3 used for EIA is captured using a mouse monoclonal antibody directed to an epitope that is not recognized by human PR3-ANCA . It is now well recognized that C-ANCA/PR3-ANCA is found in about 80% of patients with Wegener's granulomatosis, and also in about 35% of patients with microscopic polyangiitis, Churg-Strauss syndrome, and renal-limited rapidly progressive glomerulonephritis . The respective frequencies of P-ANCA/MPO-ANCA in these diseases are around 15%, 50%, 40%, and 50%. The prevalence of PR3-ANCA in patients with Wegener's granulomatosis depends greatly on the vasculitic disease activity and the extent of vasculitis when the blood is sampled. A practical consequence of finding positive C-ANCA/PR3-ANCA results has been a great increase in the correct diagnosis of small-vessel vasculitides . Preliminary data indicate that fluctuations in PR3-ANCA levels as measured by capture EIA may better reflect disease activity than direct EIA methods . A number of clinical differences have been found between vasculitis in patients with PR3-ANCA and those with MPO-ANCA . The former have more upper-airway involvement and are more likely to get clinical relapses of their disease than MPO-ANCA-positive patients, who exhibit more renopulmonary involvement and get fewer relapses. Granulomatous lesions are more common in patients with PR3-ANCA than in those with MPO-ANCA. A characteristic feature of the small-vessel vasculitides associated with ANCA is the focal necrotizing damage of capillaries, venules, and sometimes arterioles . The necrosis is thought to be the result of vigorous intravascular activation of neutrophils in the microvasculature. It is known that activation of neutrophils by certain cytokines and chemokines, eg TNF-α, IL-1β, TGFβ, and IL-8, or by microbially derived products such as lipopolysaccharides or enterotoxins can result in strong expression of myeloid-cell lysosome contents such as PR3 on the cell surface of neutrophils and monocytes . IgG ANCA directed to PR3 has been shown to act as a strong costimulatory signal for these cells, which then release lysosomal enzymes, oxygen radicals, and nitrogen oxide to their adjacent surroundings, in this case the microvascular endothelium. Neutrophils at this stage of activation are inflexible and unable to deform, and thus get stuck in the microvasculature . Release of PR3 from neutrophils and monocytes leads to detachment and cytolysis of endothelial cells, probably through induction of apoptosis . In addition, reactive oxygen species as well as lysosomal enzymes probably damage vascular basement membranes. The characteristic focal necrotizing features of the vascular damage can thus be caused by the abnormal sequestration of superactivated neutrophils and monocytes in the microvasculature. In this particular pathophysiologic setting, the serpin superfamily protease inhibitors including α1-antitrypsin, monocyte/neutrophil elastase inhibitor, antithrombin III, C1 esterase inhibitor, and others seem to give no protection against the effects of serine protease on vessel walls. To get a better understanding of the pathophysiological mechanisms of vasculitis relating to ANCA that target PR3, it is important to reveal the potential influence of specifically activated T cells in inducing a high level of production of IgG PR3-ANCA, to get preliminary data about molecular characteristics of the conformationally intact and enzymatically active PR3, and to know something about the features of the complementarity-determining regions of PR3-ANCA molecules. This minireview addresses these issues.